The RF-Container at the Chilbolton LOFAR station is an adapted shipping container. Because ships and storage facilities can hold many tens of thousands of containers, it is important to be able to identify them. As a result, containers from a given manufacturer are marked with a unique 7-digit serial number (strictly speaking it is a 6-digit code plus a single-digit checksum). Additionally, the serial number is prefixed by a four-letter code to denote the company that built the container (these prefixes always end in the letter "U"). 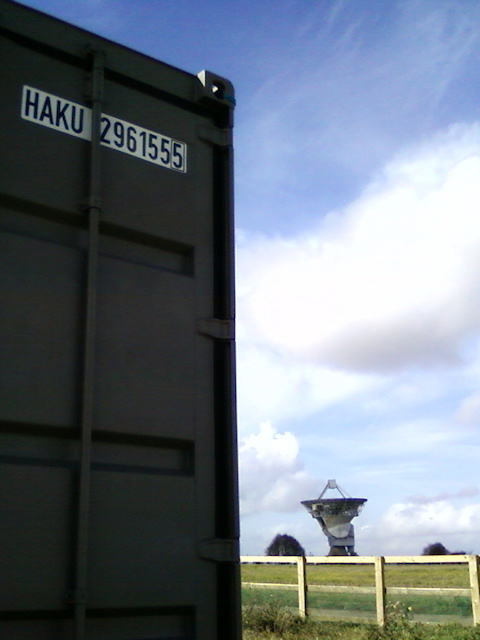 The code for the RF-container at Chilbolton is HAKU2961555. HAKU is the prefix for containers manufactured by "Container Company Amsterdam BV". However, HAKU has another meaning. During the visit from the ionospheric physics group, Derek McKay-Bukowski described the LOFAR system, with its multiple beams, rapid direction-switching and de-dispersion back-end, as an "astronomical search engine". After the presentation, an e-mail was received from Thomas Ulich, asking if we knew what the "HAKU" on the side of the container meant. While we were aware of the container serial number, as explained above, what wasn't known was that "haku" is the Finnish word for "search". Thomas explained that "hakukone" means "search engine" in Finnish; "kone" is engine, and "haku" means "search, fetch, retrieval", but also "quest, trawl". So our LOFAR container certainly has the correct name!